This page aims to help you remove FromDOCtoPDF “Malware”. Our removal instructions work for Chrome, Firefox and Safari, as well as every version of Windows and Mac OSX. A potentially unwanted program of the browser hijacking type named FromDOCtoPDF is the focus of the current article. This program may get installed on your system in a bit of a tricky way and may place some unwanted components in your Internet Explorer, Firefox or Chrome browser. You may find your default search engine or homepage replaced or you may be forced to deal with sudden page redirects and intrusive flow of ads, pop-ups and banners. Do not get panicked, though. All these will be gone just in a few minutes if you follow the instructions in the removal guide below. 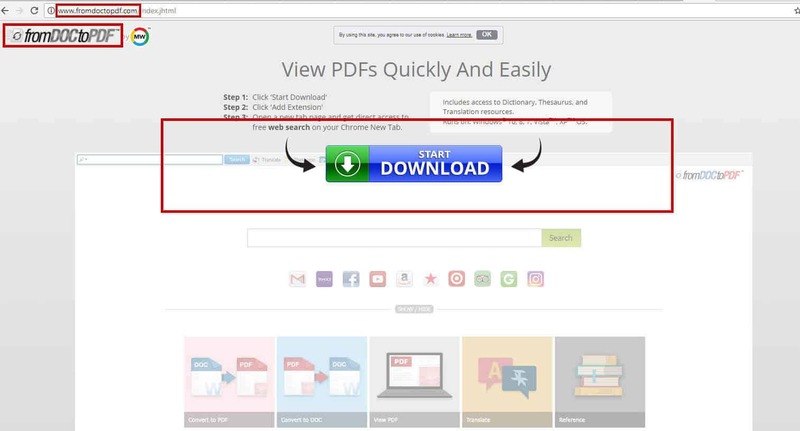 In case you landed on this page because you want to get rid of FromDOCtoPDF, then in the next lines, we are going to tell you how to safely uninstall this browser hijacker and remove all of its imposed changes. But first, let us tell you a bit more about browser hijackers in general and the tricks you can use to protect your PC from them in the future. How could you possibly end up with a browser hijacker like FromDOCtoPDF on your PC? Free download links, different freeware sites or shareware platforms of different software, torrents, spam messages and attachments of free installers are the usual sources of browser hijackers. The creators of this type of software usually use a method called “bundling” in order to insert a program like FromDOCtoPDF as an additional component of the software package of another program. When the users download and run such a package, they may unknowingly allow the bundled component to become part of their system and this way, become a victim of browser hijacking. This usually happens when they choose the Automatic/Quick/Recommended installation settings and skip reading the EULA. In order to prevent the browser hijacker (or any other potentially unwanted applications) form getting installed, they should select the Advanced/Manual/User settings instead. However, this is not enough. It is also very important to carefully follow the setup process and deselect any pre-selected entries of suggested components, recommended options and agreements. Reading the End User License Agreement and Policy of the downloaded program will also make sure that you will be informed about the presence of bundled component such as FromDOCtoPDF or even some much more hazardous hidden components such as Trojans, Ransomware exploit kits and other viruses. What may happen when FromDOCtoPDF takes over your browser? Usually, the moment it gets installed on your PC, the browser hijacker does not hide like a typical virus or Ransomware threat. It reveals its presence with immediate changes in the browser’s default search engine or homepage. It may also install a new toolbar and initiate unauthorized redirects to various sponsored sites, ads, banners and pop-up commercials. A lot of users initially think that this activity looks suspicious and may be related to some virus-inflicted processes. However, the good news is that software like FromDOCtoPDF does not aim to harm your system or infect you with viruses. Its role is to serve as an online marketing tool. Browser hijackers and similar ad-generating components are commonly used to generate pay-per-click revenue for their creators in exchange of sponsored redirects, ad clicks and increased traffic to certain advertised websites. This is the reason why you may often get redirected to find yourself exposed to numerous intrusive ads and banners that prompt you to click on them. Some people, however, despite knowing that a browser hijacker is not malicious, may really want to remove it due to the browsing disturbance and irritation it may create. For instance, the sudden redirects may really be unpleasant and sometimes, even risky. They may often land the users on some unfamiliar web locations that may look sketchy and insecure. Without having a way to check the legitimacy and safety of the content they get exposed to, many people are afraid that they may bump into some nasty online infections. Unfortunately, we have to say that this is a very real concern because the interaction with unfamiliar content and randomly generated ads, links and pop-ups may sometimes really lead to a fatal infection. With this in mind, our general advice would be to permanently remove the components of the hijacker by uninstalling them all form your system. How to safely remove FromDOCtoPDF? To make the nagging ads and browser tools disappear, it may not be enough to uninstall the browser hijacker from the list of Programs in the Control Panel. FromDOCtoPDF may reappear again the moment you run your browser because it usually installs some additional components deep inside your system that can help it get installed again in case of being removed. That’s why, to eliminate all the traits, we suggest you scan your PC with the professional FromDOCtoPDF removal tool. The instructions in the removal guide below may also be helpful, but they require more time and attention. Symptoms This program may replace your browser’s homepage or search engine with some new ones, install a new toolbar or redirect your web searches to various ads, pop-ups and intrusive banners. Distribution Method Free download links, different freeware sites or shareware platforms of different software, torrents, spam messages and attachments of free installers are the usual sources of this program.